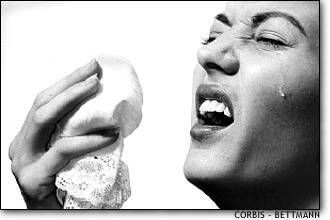 This is a collection of pages on the internet with sneezing-related stories and the like. If you've come accross any more, please send their URLS, a moi. Merci! A simply MAGNIFICENT story- well composed, well edited, perfectly encorporating the mood of the show and attitudes of the characters- which just HAPPENS to be Highlander FanFic. The adorible, tough, mysterious Methos contracts a special "immortal" cold/flu virus... and Duncan is left to take care of his friend whether they both like it or not. A Vampire story (Buffy the Vampire Slayer fanfic) with two of the girls suffering from a cold. A rather, er, visual story written about a boy with rather inetesting sneezing habbits. A poem about catching a cold. It has a very poetic version of sensing and experiencing a sneeze. A LONG story about a being named Trick who changes itself and others into other forms at eachpowerful sneeze. NOTE: +18 and Sensitive Situations X-Files Fanfic done in a slash Mulder/Skinner Universe. The story follows Mulder as he has the flu, and Scully and Skinner help him out a little. A really great Star Trek: TNG Fan Fic story in which Captain Piccard and several other crew members come down with "colds"
A man, a French maid and a feather, need more be said? This is the story of Snow White as told by Sneezy; it was written by a young kid.